Why does everyone immediately assume that Peter Pan was the hero of Neverland? He constantly causes trouble; he kidnapped Wendy and always leads the Lost Boys into intensely dangerous situations. Those don’t sound like the qualities of a hero if you ask us! Now take a look at Captain Hook. He’s the epitome of responsibility! Not only does he have a whole crew of pirates that he needs to provide for, but also needs to maintain his ship. He sounds like pretty standup guy (if you selectively forget that whole part about kidnapping Princess Tiger Lily). Okay, so he might still kind of be a bad guy, but sometimes it’s fun to walk the line between good and evil, and sometimes, your kid just wants to be a pirate with a cool hook for a hand. 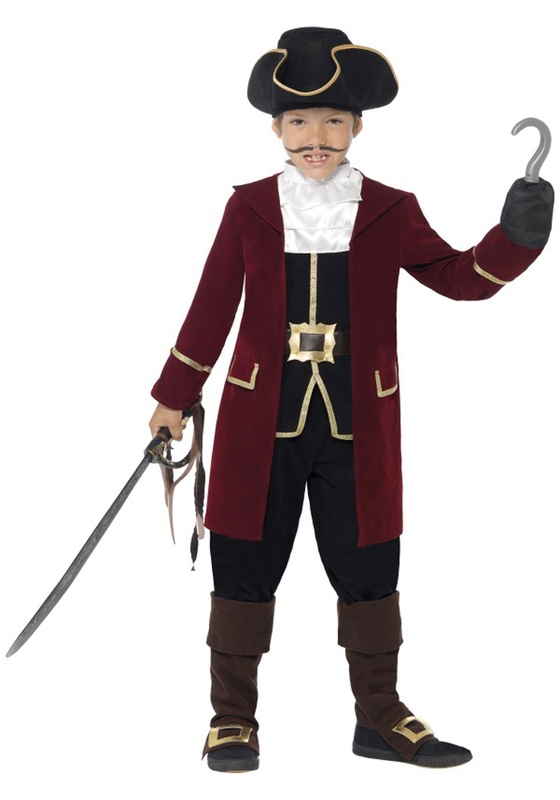 That’s why this deluxe Captain Hook costume makes for a great outfit for your child. It’s a kid’s size costume based on the character from the Peter Pan storybooks. It has a regal pirate style, coming with a burgundy jacket and a set of trousers. The costume also comes with a neck scarf and hat to complete the pirate style. When your child gets all dressed up in this costume, he’ll have a difficult choice to make. Will he cross swords with the meddlesome Peter Pan, or will he go about his business as the greatest pirate captain that Neverland has ever seen? Maybe he could team up with the young leader of the Lost Boys to become the most unstoppable duo that the land of fairy tales has ever seen!